Man, I'm fucked up over this. Matt Osborne, who was famously known as the original Doink the Clown in the WWF, has passed away at the age of 56. The reason behind his death is unknown at this time, but he'd had his own personal demons and battles with drugs in his past. We'd rather not speculate at this time. In any case, let's take a quick trip back to the early 1990s. I was lucky enough to not be into just the WWF or WCW, but soak in the whole of professional wrestling, be it TBS for WCW or USA for WWF, or ESPN for WCCW. I was all about the squared circle, and loved a good heel. Root for the bad guy and all that. Hell, I loved bad guys in the comic books. Loved that Joker. So seeing Doink the Clown, who brought this sadistic, black humor to the role of the clown (which was wild considering the whole carny aspect behind professional wrestling) intrigued me, even at 12, 13 years of age. 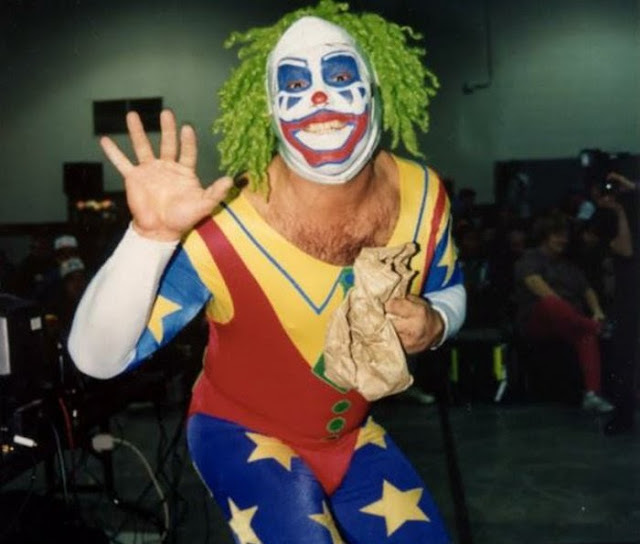 Seeing Doink come out, smiling, with the typical carnival music that turned into something a bit more sinister, paired up with him being such a beast to his opponents, either tricking them or sneak attacking them... it was awesome, and pretty revolutionary. Rest in peace, Matt. Hopefully the legions of wrestling fans will understand what you meant to the sport. PWInsider has a more detailed piece on Matt the wrestler.